Strange as it may seem, this post came to mind about 2 weeks ago when I realised I wasn't seeing any of these lovely little creatures. This time last year, I'd seen loads around, all over the place from my back garden to walking down the side of my truck. But this year I've only counted 4. It was brought to mind again when I was cleaning out the little munchers (not so little and getting bigger every day) and I noticed that I had inadvertently introduced some aphids to the their tank. "If only I had a couple of Ladybirds I could put in there", yes, ladybirds. The little beetle that's a friend to our gardeners, a bug that our children adore, an insect that is almost instantly recognisable. Yet, how many have you seen this year??? Their absence is truly shocking, last year I noticed loads of 7-spots about, a couple of years before that it was 2-spots. 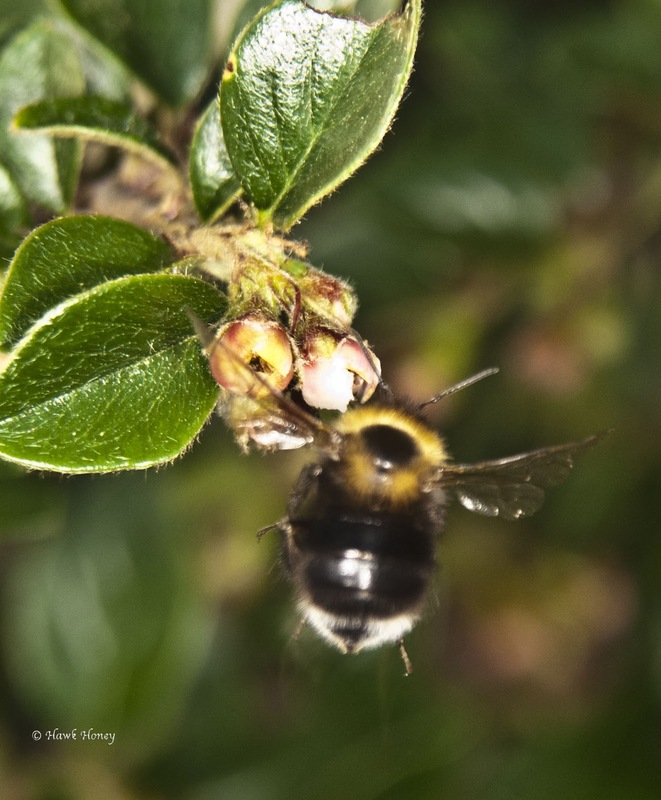 There are about 47 species in the UK, of which I've seen only about 8 of them including the dreaded Harlequin Harmonia axyridis. A species that we introduced as a biological control to aphids. Why didn't we breed or trust in our own ladybirds to do the job? Because the Harlequin has a ravenous appetite and breeds twice, sometimes three times as much as our native ladybirds so you get more ladybirds for your money. Yes, money again seems to be the issue, as I said, these species were introduced by commercial growers who wanted to have less waste in their crops to make more money. Unfortunately, no-one considered what harmful effects this non-native species would inflict on our much loved natives when they got out into the open world. A breeding, eating, killing machine. I know, sounds a bit dramatic, but this is what it boils down too. Our native species only breed once a year around April-May, yet the Harlequin, as stated previously, can breed 2-3 times a year. So all of a sudden, there's a dramatic increase in Ladybird numbers in the environment who need food. The food that has been a staple diet for our natives is suddenly being gobbled up quickly by these invaders. Our natives are hatching and finding there's not much food about. Someone (Sundby, R.A.) done an experiment back in the 60's that showed that when a ladybird larvae gets less food than normal, it doesn't emerge into the same size adult as a fully fed larvae would after reaching its final instar (we covered instars in the last blogpost). It was also found that the starved ladybird laid fewer eggs than a sated ladybird. So our ladybirds have a fight on the tarsi (insect version of hands) from the off and to make matters worse, Harlequin's don't only eat aphids, they also eat other ladybird larvae too! Yes, their carnivorous which makes it even worse. Why someone didn't think about this before they were imported beggars belief. Another testament to the inaptness of our biosecurity. They were first recorded in the UK in 2004 in the south east. Since then, their spread north and west has been rapid and aided by us and our movements of horticultural purchases around the country. This spread can be seen on the maps below provided by the Harlequin Ladybird Survey. The spread of the Harlequin Ladybird H axyridis since its detection in 2004. As you can see, it's quite alarming how this little invader has spread in 6 years. You can imagine the impact that it's had on our native ladybirds? So does that suggest that the Harlequin isn't at fault here? As many of you will know, my moth trap numbers have been extremely low this year compared to last years records. But then there's also the fact that bad years happen throughout history, yet, species always bounce back. Only problem here is that now with the new invader destroying native populations, couple that with a bad year and there's a chance some of our native ladybirds WON'T bounce back. Our 7-spot is already in decline whilst the Harlequin spreads further and further north. Nothing can be done to stop the invader either, any sprays would also kill our native beetles too. A friend of mine said he saw a Harlequin and crushed it, when I asked him how he was sure it was a Harlequin, he replied "Well it didn't look like a normal ladybird". Harlequins have over 100 pattern varieties, many very similar to our natives, I saw my first ever striped ladybird last week and I'm always looking for ladybirds. So there's a chance he could've actually killed a native ladybird because he'd never seen a ladybird like that before, which doesn't help. Secondly, killing one invader will be like a drop in the ocean and have zero effect to the spread. So if you think you've found a Harlequin, do nothing except record it. This is where you can help and it doesn't take a moment of your time. I recorded all these sightings (including the Harlequin) on a free iPhone and Android app called iRecord Ladybirds. It's a brilliant, simple to use little app that lets you record any Ladybirds you find whilst doing your day-to-day stuff. It even helps you identify the ladybird you've found with simple things to look for and pictures to help you compare your find. You can even add your own photo to the sighting with the phones camera. Tap on location and using your phones GPS signal, it'll get your location (usually to within 5 meters) and link that to the sighting along with habitat you found it in and the number you found. Then a simple tap on the send button emails it directly to the UK Ladybird Survey and to the Biological Records Centre and your work is done, so simple, why aren't you doing it? Just go to your app store on your phone and type in 'iRecord Ladybirds', this should take you straight to the FREE app, just download and away you go! It really is that simple and if you're still not convinced, go to this BBC news report of the decline of our 7-spot ladybirds to see it in action. 'Ladybirds' from Pelagic Publishing. Highly recommended. It's pretty much the only book you'll ever need if you want to get into ladybirds. It covers everything from life history, evolutionary biology, population and more. It also has a key to help you identify and a section on how and where to collect ladybirds for recording. If you like ladybirds, you'll like this book! 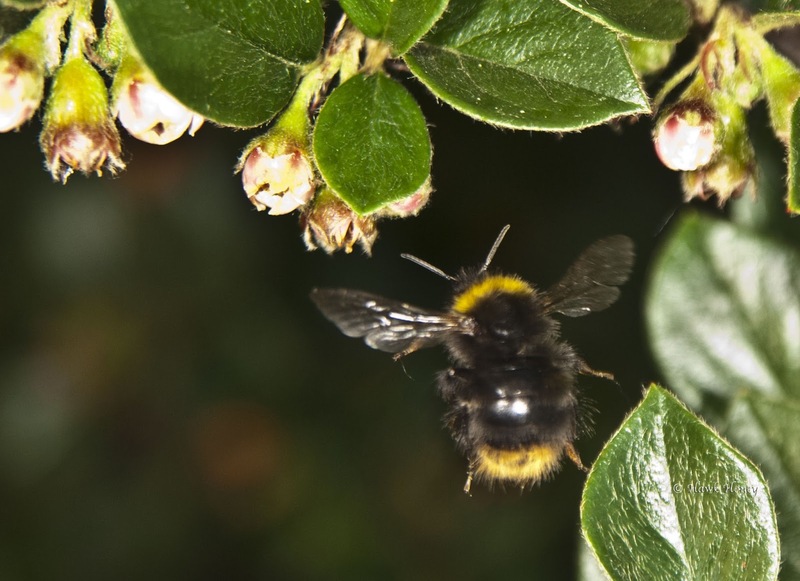 If you don't have a smartphone or are not sure on how to get the app, then try the UK Ladybird Survey website instead. Well my little munchkins are (at the time of writing) still on their 3rd instar. However, I did come across this whilst cleaning them out this week. From left to right; 1st, 2nd and 3rd instar emperor caterpillars. A 1st, 2nd and 3rd instar all together. Strange considering that they all hatched around the same time that some are still so far behind in their development. Maybe you get runts in insects too, who knows? Some have also began to change their colours now opting for a brighter green colour instead of the deadly looking black with red spots. A change of colour and a lot of frass. Although I've been warned to give them plenty of space, which I have duly done, they still seem to like hanging out together, devouring the same leaf at times. As you can see from the above photo, an increase in appetite also means an increase in frass and it's getting bigger too! Sorry for the blurry image, I was shaking in shock! This translucent, maggoty like creature turns out to be the larvae of a hoverfly and known to eat aphids and other insects. Whether or not he would attack my 3rd instar caterpillars, I don't know, but I'm not taking any chances. He's now been removed to a separate container to see what species of hoverfly he'll (or she'll) hatch into. Hopefully, this shouldn't take long as it's gone into pupae stage now and should hatch in about a week I reckon. Larvae has moved into the pupae stage. I'll take a pop at an ID as the larvae is of the 'bird dropping' type and say it belongs to Meligramma species of hoverfly. We'll see. Now hear (or read) this! Every now and then, something happens that's like a breath of fresh air and it happened to me on Sunday, when, checking my blog I noticed I had a new follower by the name of 'Beetle Boy'. On further investigation it turns out his name is Jacob and he's 10 years old AND he has a blog which I can only describe as a joy to read. It's so nice to see someone of his age have such a passion for the nature that surrounds him and to share his experiences with us through this blog. Go there now and have a read then tell your friends to go there too. You can find his blog here Beetle Boy's BioBlog. And one more thing, hello Jacob, my newest follower and welcome. Glad to have you aboard. Also glad to have aboard is ANOTHER follower (my, I'm getting popular) Carole. Welcome to you too Carole. 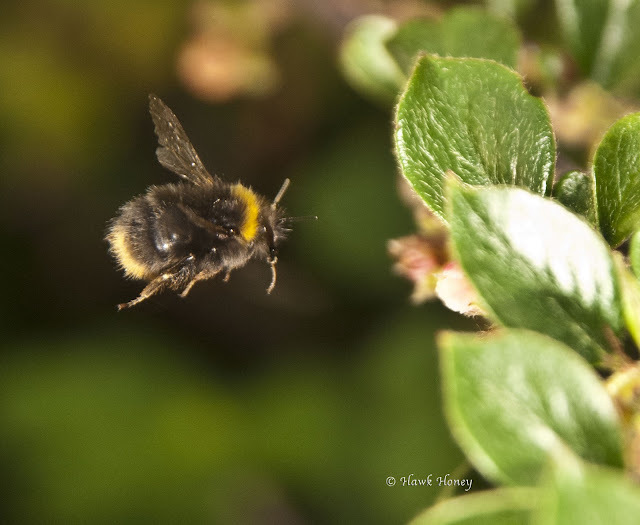 As I reported last time, I have a bush outside my home that is continually buzzing with the sound of about 50+ bees busy collecting food for their hives. Yes, hives. I popped outside the other day to see if I could grab some shots of the little fellows doing their work and noticed that they weren't all the same species. As far as I could tell, and I'm no bee expert, there appears to be about three species, possibly four, at work here. The picture above shows a Buff-tail (I think) Bumblebee Bombus terrestris coming in to land on a flower. 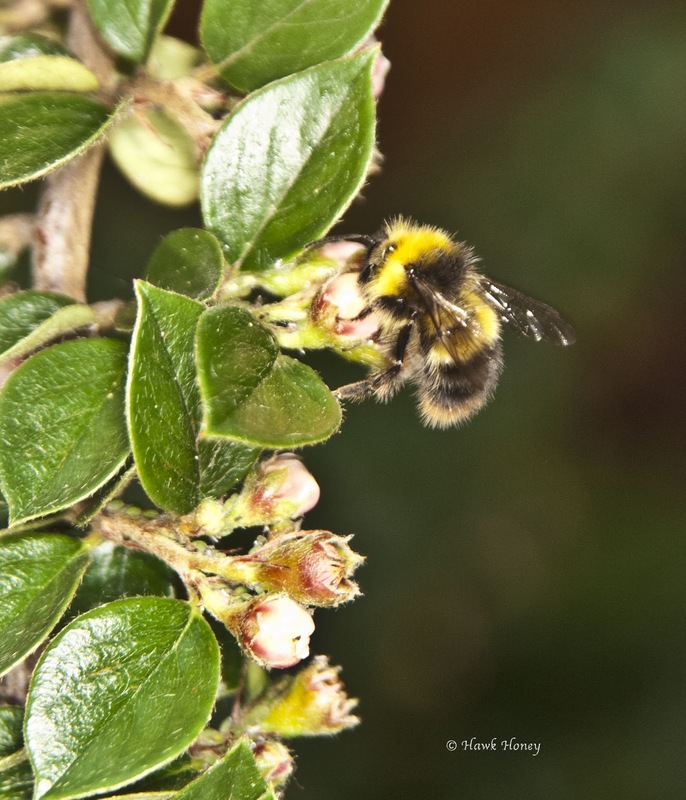 But I've also spotted Tree Bumblebees B hypnorum and possibly a Shrill Carder Bee B sylvarum feeding and buzzing around the bush. All these were taken feeding from the same bush, which I believe is a Cotoneaster, which I'm told is a highly invasive non-native species. It's something that's been outside our window from the day we moved in here and I'm quite prepared to leave it there considering how much the bees love it. Well, not quite, but compared to the last couple of months, it's better than nothing. 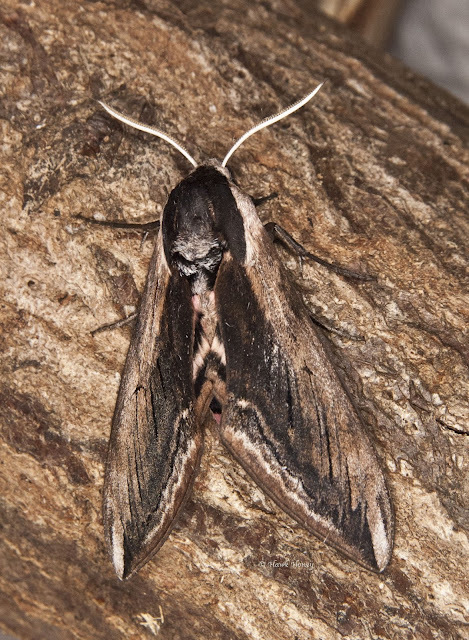 My Privet Hawkmoth Sphinx lugustri (love this latin name) revisited me this week and this time I took a picture of it. Such a beautiful moth and I found it cuddled up next to a site newcomer. Yes, another Hawkmoth, but this time it was a Eyed Hawkmoth Smerinthus ocellata. 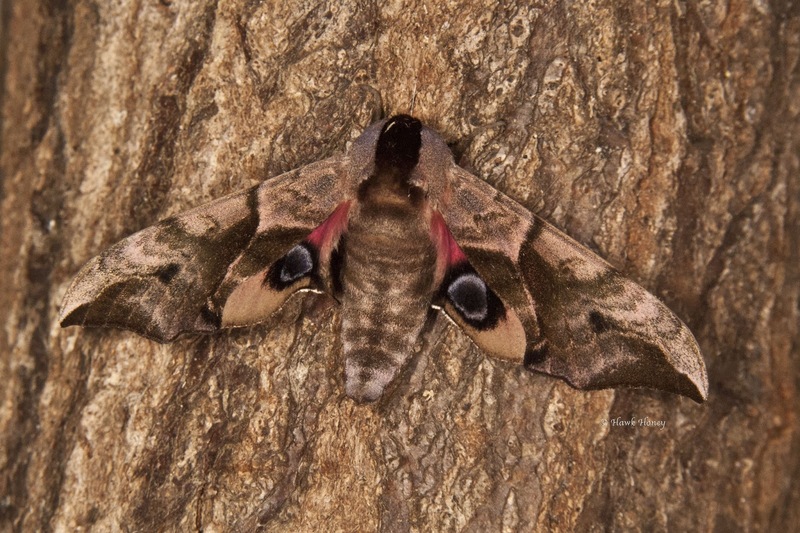 Eyed Hawkmoth S ocellata displaying its eye markings. As you can tell from its name, it has eye markings, one on each wing. These are not normally seen and this can sometimes make for the mis-identification of it being a Poplar Hawkmoth Laothoe populi. The eyes of the moth are on the hindwings only and usually tucked up under the forewings. The markings are only displayed as a deterrent to predators such as birds and as actually been proved to work. When it displays the markings, the moth also rocks from side to side adding to the effectiveness of the deterrent. Also on the increase, well, in my pond that is, are damselflies. Last week I showed you a picture of some Large Red Damselflies Pyrrhosoma nymphula mating. However, this week has seen a mass hatching of Blue-tailed damselflies Ischnura elegans from the pond. These damselflies are not all uniformly the same colour as they tends to be various forms and maturities. Another variation is a pink-ish coloured one which could be a female form. They seem to be loving my Bullrushes and I can usually find them there sometimes all lined up along one leaf. At one point whilst plucking some leaf litter from the pond, my wifey told me that three of them landed on my back. When I turned around, she laughed saying there was one on my forehead. So they are quite friendly, which may be news to some people. I met a man last week on a walk who asked me what I was looking at when he saw me spying through the binoculars at the bank opposite. I told him I was looking at a dragonfly. "What, one of those big things with the long tail that quite give you a really bad sting?" he replied in disgust. "Yes, one of those, but they're completely harmless and cannot sting you as they don't have a stinger." I told him. He looked a bit puzzled as if I was telling him a fib. When I told him I was an amateur naturalist and I study insects he seemed a lot happier. "Oh, fishermen have told me that they're evil things that sting"
Which just goes to show, you shouldn't believe everything you hear. If you really want to know what's at the end of the very long tail of damselflies and dragonflies, I'll tell you. It's their genitalia, nothing more or less and nothing they can sting you with either. When I told the gentleman this, he blushed as if I had said something rude. Really! Even though I have these land on me all the time, they can be a bit bashful at times when it comes to having their pictures taken. However, it can be difficult trying to hide behind a bullrush leaf. 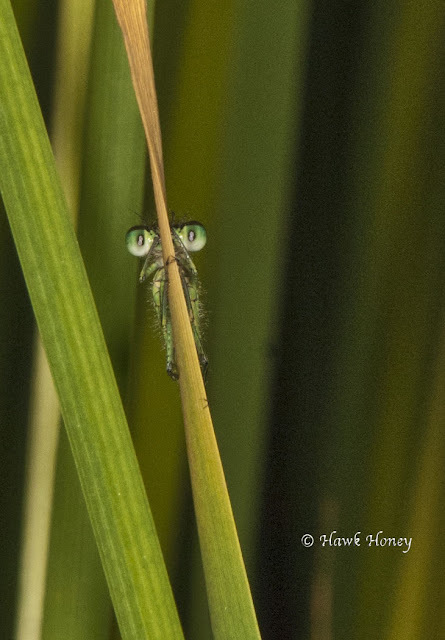 I also got a question from my friend Mick regarding how to tell the difference between damselflies and dragonflies. 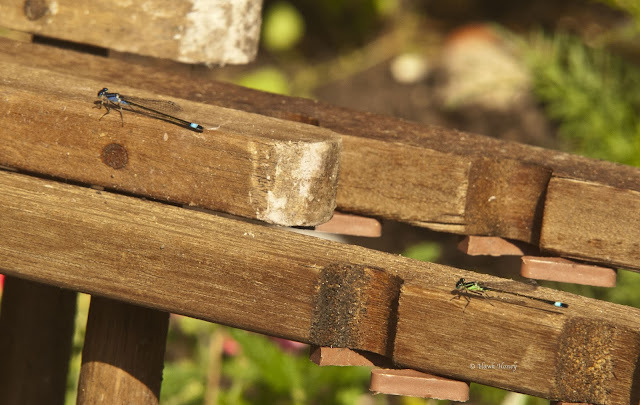 The answer is quite easy, when they are at rest and not flying, damselflies will hold their wings back over their body whereas dragon flies hold their wings out at 90º to their bodies. Only (as far as I know) one damselfly hasn't read the book, or it's trying to be a bit different and that's the Willow Emerald Damselfly Lestes viridis. They hold their wings back at a 45º angle and they are a lovely metallic green too. Before I go, I just thought I'd share one more picture with you. 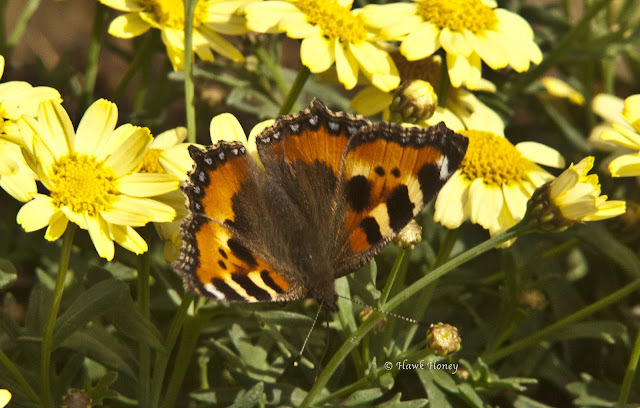 This Small Tortoiseshell Aglais urticae paid a visit to my yellow daisies yesterday. Small Tortoiseshell A urticae a pleasure to see. Another enjoyable blog. Like you Hawk I'm yet to see a Ladybird. Haven't even seen a Harlequin and our plants are now covered in Blackfly!